Most everyone knows that behind Batman's cowl is millionaire Bruce Wayne. And behind Spider-Man's mask is young photographer Peter Parker. Older readers might even know pulp hero The Green Hornet as the crime-fighting identity of newsman Britt Reid. But for a brief period in the late-1960's, all of those superhero masks were worn by only one man -- Ideal Toy's Captain Action. In retrospect, it must have been a licensing nightmare. Not only characters from longtime rivals Marvel and DC Comics, but also famous heroes from the comic strips -- Buck Rogers, Flash Gordon, and Steve Canyon, among others -- all became the basis for a memorable and highly collectable action figure toy line. Ideal's Captain Action, launched in 1966, was in direct response to Hasbro's highly popular G.I. Joe. But while Hasbro took the more realistic route and limited G.I. Joe to the four branches of the military, Ideal took the concept of interchange- able outfits one step further. They sought to capitalize on the rising popularity of comic books and the hit Batman tv show. Here was a doll -- a heroic action figure in his own right -- who could be transformed into any one of thirteen of the most popular heroes of the day. The idea was really quite simple. The basic Captain Action figure -- slightly larger and even a bit more detailed than G.I. Joe -- wore a blue and black outfit with a colorful "CA" emblem on his chest. He came equipped with a blue raygun, sword, and hat. But while Captain Action could be played with and enjoyed on his own, the real fun could be had with the additional costumes that were sold separately. By slipping a mask over his head and replacing his standard outfit and accessories, you could instantly change him into your favorite superhero. Nine different outfits were available that first year, each packaged in attractive and highly colorful window display boxes. >From DC Comics there was Superman, Batman, and Aquaman; from Marvel, Captain America and Sgt. Fury. And from various newspaper syndicates came Flash Gordon, The Phantom, Steve Canyon, and The Lone Ranger. Each outfit set included a one or two-piece facemask, a remarkably detailed costume, boots, and a handful of accessories unique to that character. Batman's outfit was faithful to both the comic and popular tv show of the time. In addition to his blue and gray costume, cape, and boots, he came equipped with a utility belt, batarang, flashlight, laser, and grappling hook. Flash Gordon came with a white space suit and two-piece helmet, blue space belt, silver raygun, and a two-piece "guidance gun." Superman -- a character who usually used no gadgetry in the comic books -- was given a "phantom zone projector," arm and leg shackles, and a chunk of green Kryptonite. And let's not forget his faithful dog Krypto, complete with red cape. Ideal seems to have stretched a bit to come up with accessories for some of its characters. Most bizarre, perhaps, are the truly inappropriate accessories given to Marvel's Captain America. His patriotic shield is certainly a necessity, but lacking any other devices in his crime-fighting arsenal, Ideal was compelled to give him two new weapons: an ultrasonic pistol and a matching laser rifle. The next year, Ideal added to the Captain Action line by giving him a youthful partner, a kid sidekick named Action Boy. Action Boy, standing only 9" tall, came dressed in a blue and red outfit with an "AB" logo on his chest. He came with a utility belt, beret, boomerang, and knife. Oddly enough, he also came packaged with a rather unique pet -- a black panther. For Action Boy, Ideal released three outfit sets: Superboy, Robin, and Aqualad. Each came packaged in a window display box with colorful costumes and accessories. Superboy, for example, came equipped with a telepathic scrambler, language translator, and chemistry lab. For Captain Action, four new outfits were added that second year (Sgt. Fury, though, was cut, probably because of his similarity to G.I. Joe). Because of their more limited production, these four sets are harder to find and are therefore more valuable. Joining The Lone Ranger was Tonto, his faithful partner, and continuing the outer space theme begun by Flash Gordon was the futuristic hero Buck Rogers. But the two Captain Action outfits that remain most in demand by collectors are Spider-Man and The Green Hornet. Spider-Man's accessories consisted of a spray tank and hose (to spray his webfluid, no doubt), "spider hook" with rope and handle, flashlight, and a yellow spider. The Green Hornet was perhaps the most complex of all the Captain Action outfits, and is arguably the rarest. It may, in fact, have been cancelled earlier than the others due to the demise of the tv series in 1967. Instead of the usual form- fitting costume, Green Hornet wore pants and a dark green trench coat, and came with shoes, mask, hat, and an assortment of weapons. The small size of many of these pieces made them easy to lose and, therefore, they are very hard to find and relatively expensive. The limited supply and great demand for these two sets make them the most expensive Captain Action items available. The second series of costumes (as well as the re-released first series, minus Sgt. Fury) all included an extra bonus -- a silver "video-matic" flasher ring. Each ring had a picture of its specific character on it that, when looked at at an angle, changed into Captain Action. (The original rings had silver bases; remaindered flicker photos were later pasted onto blue plastic bases that are much more common.) It should be noted here that the second issue Lone Ranger outfit came with a blue shirt in place of the original red. It's been speculated that this was done to make the figure look more like the tv show Lone Ranger than the character from the 1950's comic strip. To further the concept of Captain Action himself as an action figure, Ideal released accessory packs designed just for him. Six different packs were issued, each in window boxes that showed you exactly what you were getting. The final two accessory packs contained a complex assortment of items. The orange Survival Vest came with over a dozen separate pieces -- everything from a first aid kit to a flare pistol. The Weapons Arsenal loaded the Captain up for Action, giving him knives, hand grenades, and several new guns which all fit on a plastic storage rack. And what's a superhero without his own vehicle? Captain Action was given the Silver Streak, an amphibious (half-car/ half-boat) vehicle that rolled along on 3 wheels and included two spring-loaded missiles. If you ordered the car from Sears, it came in a colorful cardboard garage that doubled as its shipping box. The third wave of Captain Action toys brought with it several minor changes and one major addition. Because a hero works so much better with an adversary to fight, Ideal finally gave Captain Action a villain -- the nefarious Dr. Evil. Why Dr. Evil wasn't given comic-inspired super-villain outfits to wear isn't clear -- imagine if he could have transformed himself into the Joker or Dr. Octopus. Instead, Ideal made him a "fiend from outer space," and gave him light blue skin and an exposed brain. He came dressed in a blue tunic with sandals and a pendant, and came equipped with a laser gun and a human face mask. Dr. Evil also ushered in a new style of figure packaging -- the photo boxes. Instead of the artwork that graced the earlier versions, these new boxes pictured the actual figures in action poses amid a diorama setting. On his box, Captain Action is shown standing triumphant over a prone Dr. Evil, while their roles are reversed on the evil Doctor's box. Action Boy not only received a photo box of his own, but also an entirely new costume. Instead of his blue and red outfit, he now came with a silver and blue space suit. Shortly before the Captain Action toy line was cancelled, Dr. Evil was released in a special Gift Set that included not only the basic figure, but also a lab coat, two new disguises, and several new weapons, including a "hypnotic eye." Rounding out the Captain Action accessories are several vinyl carrying cases. In its 1966 catalog, Sears offered Captain Action with a Batman costume for $7.99, and included with it an exclusive "Quick-Change Chamber." The next year, the Chamber was replaced with the more common Captain Action Carrying Case (which was also sold separately). Montgomery Wards offered as its exclusive an "Action Cave," notable for its "M"-like shape (representing twin mountain peaks). Finally, Dr. Evil was given his own Sanctuary, a pyramid-shaped carrying case. Coming full circle, DC comics produced a Captain Action comic book beginning with the October 1968 issue. Since the toy line was cancelled shortly after, only five issues were ever published. A small comic book/catalog was also included with the figures and outfits starting with the second series in 1967. It replaced an illustrated flyer that was included in the first series boxes showing the various Captain Action outfits. During the unfortunately brief height of Captain Action's popularity, Aurora produced a model kit that closely duplicated the early box cover art, while Ben Cooper produced a scarce Halloween costume. A set of Captain Action playing cards were offered as a mail order premium from Cool Pops. 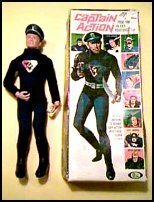 Ideal cancelled the Captain Action toy line in 1968. Rumor has it that a Kato outfit was planned for Action Boy, while Dr. Evil was scheduled for Joker and Red Skull costumes. Who knows what else might have been in store had the line continued several more years. Still, though he lasted only a short time, Captain Action left his mark on the toy collecting hobby.